BARCELONA, Spain — Among the 60,000-plus spectators packed into the Santiago Bernabeu for the return of Zinedine Zidane, nobody seemed happier than Francisco "Isco" Alarcon. Having his old coach back in charge has given Isco a second chance to salvage his career at Real Madrid— and his status as one of Spain's top talents. During Zidane's nine-month hiatus from coaching, Isco went from title-winner to soccer outcast. It had gotten so bad for Isco under the recently fired Santiago Solari that he had to watch several matches from the stands. The playmaker scored the opening goal of the 2-0 win over Celta Vigo on Saturday to end a horrendous run of four consecutive home losses for Madrid that led to Solari's exit. 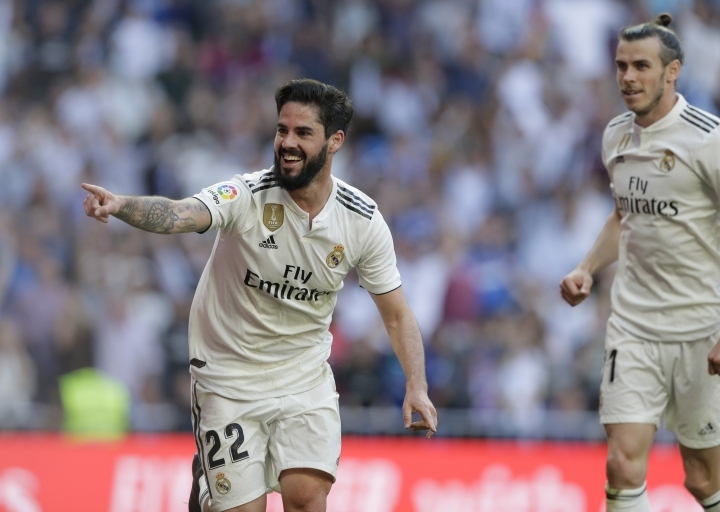 Isco was among several members of Zidane's "old guard" to recover their spots in the starting 11 after seeing their playing time diminish during Solari's 4 1-2 months in charge. Others included Marcelo and Gareth Bale, who combined for Bale to score Madrid's second goal, and Marco Asensio, who set up Isco's goal, and goalkeeper Keylor Navas, who had become a backup to Thibaut Courtois. "Nobody is going to take away what they have done here," Zidane said about his veteran players. "Keylor is very good, and what can I say that you don't already know about Marcelo, Isco and Bale? They looked good to me, Isco got a goal. I will count on them all because they have shown positive things." Having helped Madrid win the Champions League four of the last five years, the 26-year-old Isco was until recently considered the future midfield star of the Spanish national team. But his absence from Madrid led to Spain coach Luis Enrique dropping him from his squad for the team's first two European Championship qualifiers later this month. Being rescued from obscurity does not mean that Isco has definitely reclaimed an important role on Zidane's team, however. Zidane used to play Isco often enough, but he never included him in his core group of players who always started if healthy. And almost nobody's place is safe at Madrid following a disastrous season that included a humbling round-of-16 exit from the Champions League to Ajax and a record of three losses and a draw in their four meetings with fierce rival Barcelona. Madrid president Florentino Perez will want to overhaul his team this summer, meaning some of its current members will be sold. Isco, and the rest of his teammates, have 10 league games left to convince Zidane and his boss that they deserve to be part of next season's rebuilding effort. They appear to have nothing else to play for, trailing Barcelona by 12 points in the Spanish league. "There will be changes, but I will not be looking at these games if everyone does well ... to see if they stay or leave," Zidane said. Isco, if he wants to stay, can only hope that Zidane's words do not mean the club has already made its decision on his future.